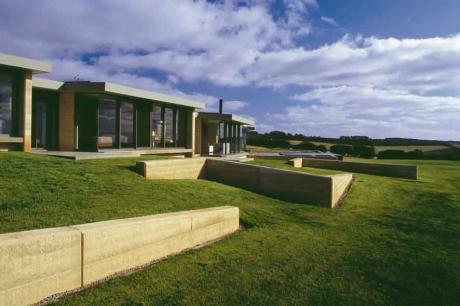 The Rammed Earth House is a private residence located on a rural property on the Mornington Peninsula, Victoria Australia. With integrated landscaped garden on a 97-acre property this holistic architectural project blurs the line between architecture, interior, landscape and furniture design. Careful consideration was made to site and context to ensure the house contributes to the rural characteristics of the area from all exterior and interior vantage points. Sightlines from adjoining properties and roads were an influencing component to the master planning. Constructed predominantly in rammed earth, concrete and steel, this split-level house seemingly rises from the landscape and cranks to capture the sweeping rural and coastal panoramic views. Individual modules containing each living zone; lounge & dining, bedrooms & bathrooms, study & kitchen, are interconnected via a feature corridor; ‘the alley’. The western elevation consists of solid rammed earth walls without penetrations, designed as thermal banks capturing the afternoon sun. The eastern elevation is glazed to siphon dominant views inside. Designed around a large enclosed courtyard that provides protection from the gale force winds, this outdoor room allows northern sunlight to filter into the main living areas. Buffered from the main house by the courtyard is a self-contained sleeping and living zone, connected to the main house by a glazed link that can slide open to integrate the wet-edge pool and associated deck. The deck area and swimming pool becomes the pool fence, by elevating this level as a viewing platform.